Don't forget to enter my giveaway. You can click on giveaway or just click the picture of the Le Creuset dishes at the top left of my blog. Happy Birthday to my son Skyler who turned Sweet 16 on Saturday! 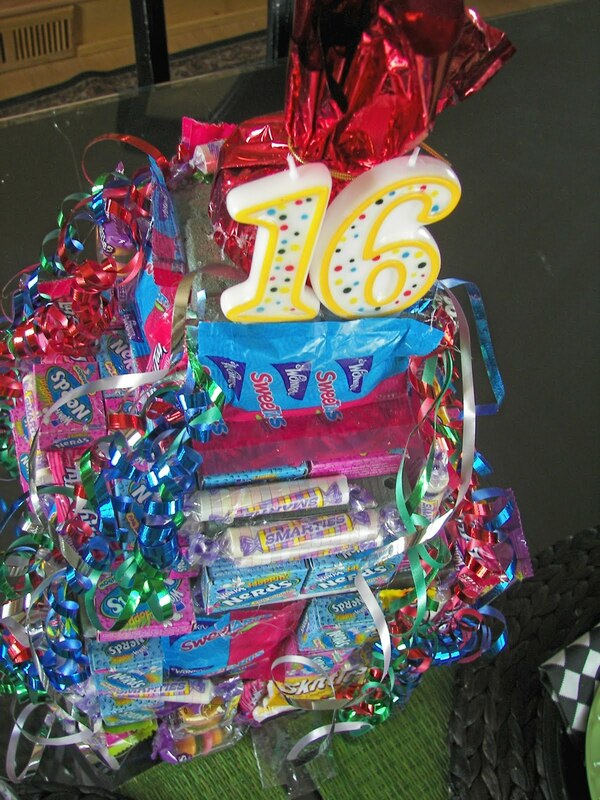 We surprised him with this candy tower at school on Friday. By the end of school, of course, there was no candy on the tower! This is a spin-off of something we did at my high school in Wisconsin. When you turned 16 your friends would bring you "candy ribbons" for you to wear. They would basically attach candy with tape to ribbons, the 1/2-inch sized wrapping paper ribbon, and attach a bow to the top. They would pin it on you and all day long people would pull candy off your ribbons. If you had a lot of friends, you would be wearing a lot of ribbons! It was a fun tradition! 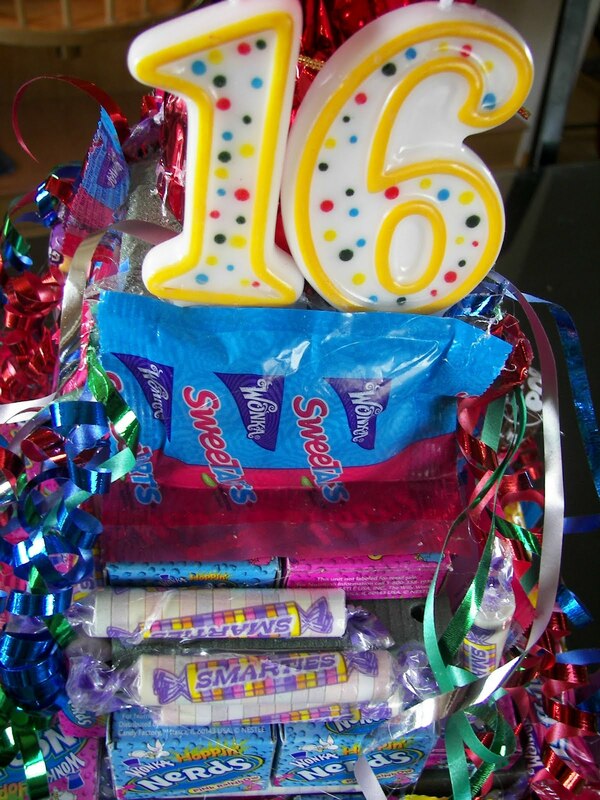 I found this candy tower idea on Cheap Chic Home's Web Site. I am a follower of her web site; she has a lot of great ideas. As soon as I saw it I knew I wanted to make one for my son's 16th. 1. You need some oasis or styrofoam blocks. I used 4 larger oasis blocks for the bottom part and two smaller oasis blocks for the top part. The bottom oasis came in a package of two, shrink wrapped. I kept the shrink wrap on the oasis. 2. Hot glue the two bottom pieces together (4 blocks) and then glue the two smaller pieces together. Glue the smaller pieces on the top of the bottom pieces. 3. 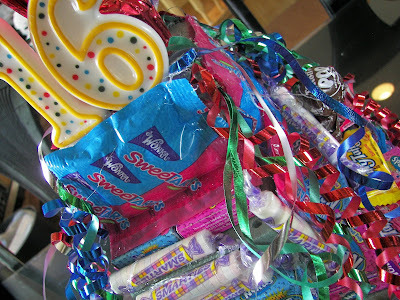 Using a low-heat hot glue gun, glue on the candy. My daughter Talley helped me! 4. Finished it off by gluing some candles...no, we didn't light them, curling ribbon, and a balloon weight-- the kind that looks like fireworks --- from the Dollar Store. What I really like about this is that we took it to school and all the kids ate the candy --- and not me! What a cute idea and especially for a boy since 'sweet' sixteen can be so girly! Very CUTE idea! It looks great. Aww, thanks so much! I love the addition of the "16" candle and all of the curly ribbons. You did such a nice job. I'm so happy I could inspire you. Oh, I remember the candy ribbons! So much fun! Awesome idea- and happy birthday to your son! what a cute idea...i also LOVE the candy ribbon idea..never heard of anything like it, but it is such an adorable tradition! What a nice idea for a a boy. I don't know any high school boy who wouldn't love this. I've never seen this done before...I love this idea. My 20 somethings would love this to take to work! I love this idea. How much fun! I think everyone would like to have this delivered to them at school or work! Thanks for the idea - I think I'll have to make this! Great birthday idea - and it would work for just about any age. My son just turned 16 also ! What a fun birthday idea!! These would work for anyone, any age! Great idea! !